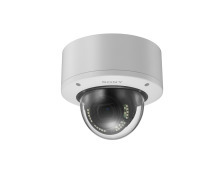 Birmingham (IFSEC stand 4/J10), 13 May 2013: Today at IFSEC 2013 Sony introduced a small and affordable wireless camera, the SNC-CX600W, designed specifically for small businesses, retailers, restaurants, hotels and private residences. Sony is demonstrating its intention to innovate within the video security market and cater for new audiences with this latest addition to the range. The SNC-CX600W camera comes with HD (720p) and wide angle view (120°) to produce high quality pictures for detecting crime and disturbances as they happen. The camera also features a passive infrared (PIR) sensor for detecting movement in the dark and a white LED light for illuminating the scene automatically when motion is detected or when activated by the user. As a result, the need for additional equipment is greatly reduced. The SNC-CX600W camera is designed with a quick and easy installation in mind. The user friendly solution keeps cable management to a minimum as video can be streamed wirelessly and saved to the micro SD memory card on board the camera. 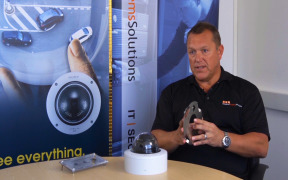 This new camera also seamlessly fits in with its surroundings with a stylish and compact finish, meaning that the camera can be positioned within confined areas without compromising the level of surveillance capability. In addition, the SNC-CX600W supports two-way audio using a built-in microphone and speaker. This new camera also features Sony’s edge based analytics which comes with intelligent motion detection, face detection and DEPA already pre-installed and ready to use. The SNC-CX600W will be available in autumn 2013. Suggested pricing will be announced in due course.